Alabama is a deeply conservative place, as its voting record amply demonstrates. Until Doug Jones came along the state hadn't picked a Democrat for the US Senate since 1992 - and even that man, Richard Shelby, went on to defect to the Republicans. But on 12 December Mr Jones, 63, painted the old red seat blue when voters chose him to fill Attorney General Jeff Sessions's former berth. So what do we know about the man who fought and beat Republican Roy Moore for the heart of Dixie? When Mr Jones beat seven other candidates to win the Democratic primary in August 2017, it was the entry pass to a seriously tough fight. But he would argue he's used to those. Gordon Douglas Jones, known as Doug, studied political science at the University of Alabama, followed by law at the state's Samford University in 1979. He rose to prominence in 1997, when Bill Clinton named him US Attorney for the Northern District of Alabama. Then in his forties, Mr Jones secured a string of high-profile prosecutions, including those of two Ku Klux Klan members who bombed a Baptist church in Birmingham in 1963, killing four black schoolgirls. He was also linked to the indictment of Eric Rudolph, who killed an off-duty police officer in a 1998 attack on a Birmingham abortion clinic. This record has helped Mr Jones present as a candidate for our violent times, where white nationalists are raising their banners unafraid on the streets of America. "Sadly, the pattern of violence as a response to hope has reasserted itself," he wrote in the Huffington Post. "We saw it in the Charleston church massacre in 2015. We saw it on display in Charlottesville this past August. We've seen it in the attacks on mosques and synagogues, and against the LGBT community. We see it in the hostility toward the Latino community. "We cannot sweep this violence under the rug. We must address the forces that lead to it and prosecute those who perpetrate such acts." Though Roy Moore's evangelical fervour grabbed more attention, Mr Jones is also a Christian - specifically, a Methodist. He has worshipped at the same church for more than 30 years, and has said the message of Christianity should be one of fairness and inclusivity, not extremism. Politics took an early hold on Jones, who began his career as a staff counsel to the US Senate Judiciary Committee, working for Alabama Senator Howell Heflin. From 1980 he spent four years as an Assistant US Attorney, then from 1984-97 worked for a criminal defence firm in Birmingham, Alabama. In 2013, he co-founded his own firm - Jones & Hawley. Mr Jones counts former Vice President Joe Biden as an old friend, having led his 1988 presidential campaign in Alabama. Mr Biden said of him at an October 2017 rally: "I can count on two hands the people I've campaigned for that have as much integrity, as much courage." He added that Mr Jones "helped remove 40 years of stain and pain from this state" with the church bombing convictions. 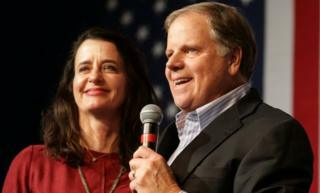 From the off, Mr Jones was aware he was facing poor odds in Alabama, which backed Donald Trump in 2016 with a 28-point landslide. "They have told me time and again that this race is a long shot," Mr Jones said of the problem. "Well, folks... When you are on the right side of history and the right side of justice, you can do anything." The delicacy of the task was complicated by allegations against Mr Jones's anti-establishment opponent, Roy Moore. The gun-toting Republican faces several claims of historic sexual misconduct with underage girls, which he denies. Mr Jones's campaign adverts have worked to paint him as the ethical choice for Alabama, even as prominent national Republicans broke ranks to refuse Mr Moore their votes. Some ads featured self-declared Republican voters voicing their support for Mr Jones with the words: "Don't vote for the party. Vote for the man." The New York Times reported in mid-November that Democrat cash had funded nearly $2m (£1.5m) in TV adverts for Mr Jones, while Mr Moore had spent only about $300,000. Policy-wise, Mr Jones has pitched himself as a moderate Democrat, calling for an increase in the minimum wage, but also lower corporate taxes "to try to get reinvestment back into this country". He supports renewable energy, but is hawkish on the need for increased defence spending, saying it will protect the US and shore up Alabama's economy. On healthcare, a key divide between Republicans and Democrats, he opposes the repeal of the Affordable Care Act, known as Obamacare, but wants changes to the existing "broken" system. While President Trump has stoutly supported Roy Moore, national stars of the Democratic Party waited until the last minute to descend on Alabama, to avoid spooking voters with their liberal associations. On the eve of the election, reports said former President Barack Obama had recorded a robo-call - an automated telephone call to Alabama households - urging the public to back his man. "This one's serious," Mr Obama said in the message, according to CNN. "You can't sit it out." Other senior Democrats who have spoken for Mr Jones include Ohio congressman Tim Ryan, and John Lewis, a revered civil rights leader who was one of the original Freedom Riders and led a famous protest march from Selma in Alabama. New Jersey Senator Cory Booker, a rising Democrat star considered a possible 2020 presidential candidate, made the trip to Alabama in person, declaring: "I'm here to try and help some folk get woke. Democracy is not a spectator sport." Mr Jones has proved he is capable of causing a stunning upset in the ruby red Yellowhammer state. Now he'll be returning to work for the federal government for the first time since making his name with the church bombing prosecutions.